Satellite imagery confirms that a spin has developed in the monsoon trough. It appears to be close to depression status and may be upgraded within the next 24 hours. It is moving west away from Mexico at this time. NHC very appropriately went strait to a tropical storm. Lowell's spin is very apparent on the satellite imagery. Deep connvection is near the core circulation and additional strengthening is likely. 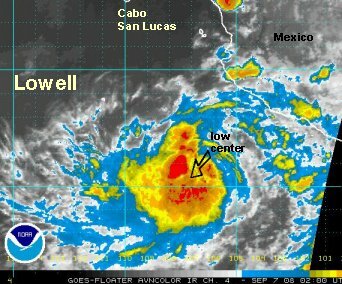 Lowell is moving just north or due west and is centered about 265 miles west southwest of Manzanillo, MX. 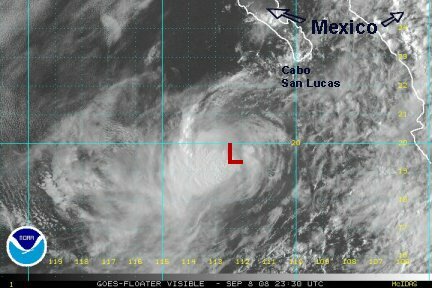 It will pass well south of Cabo on this path. Lowell appears to have strengthened some. NHC's official forecast left Lowell at 40 mph. We believe 45-50 mph at this point. 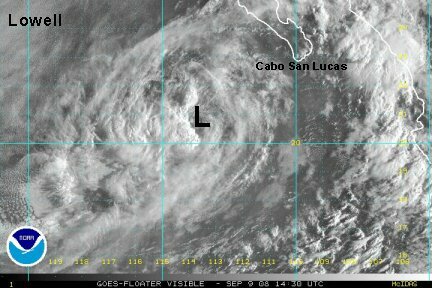 It is roughly 500 miles south of Cabo and moving west northwest. 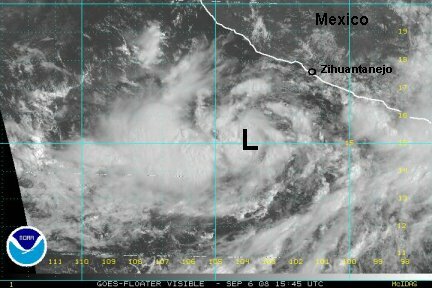 Lowell is not a threat to Mexico for the exception of a stray storm. 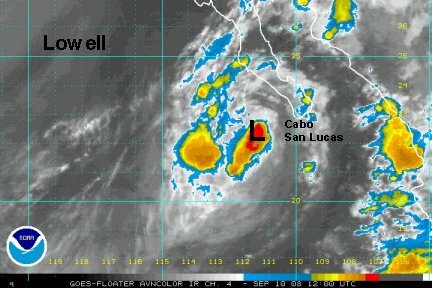 Lowell is about 400 miles sse of Cabo San Lucas. Lowell was upgraded to 45 mph by NHC in their last advisory to agree with our previous assessment. Since then, easterly wind shear is pushing the convection away. The surface center is now exposed. It this persists, Lowell won't be around for very long. The windshear didn't last too long. 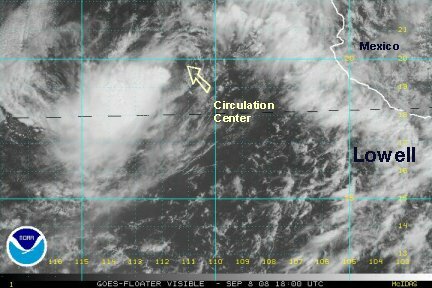 The easterly winds that pushed the convection west of the circulation center has relaxed. This has allowed the storm to strengthen. NHC's last advisory had 50 mph, which seems fine. 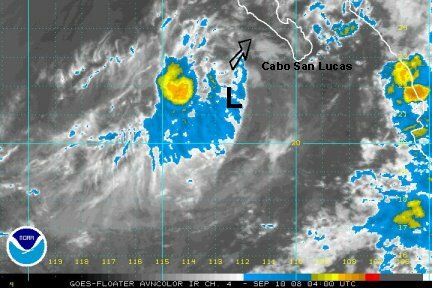 It is still well south of Cabo and not seen as a threat in the immediate future. A trough may pick it up though in a day or two and swing it back into the Baja. Lowell has undergone convection bursts over the past 12 hours causing its wind to increase and decrease. NHC had its top windspeed up to 60 mph, then just lowered it to 50 mph on the 8 am pdt advisory. We think that they have had a good handle on the forecast so far. The forecast models still call for a trough of low pressure to turn Lowell toward the Baja in a day or two and make landfall in the southern Baja, north of Cabo by late this week. It will probably late Thursday or Friday. The trough should weaken Lowell with wind shear, so it shouldn't be much more than a breezy rain storm at that time. Upper air winds have pushed the convection to the southwest side of the circuation center. This has left Lowell exposed again. The official top sustained winds were 50 mph on the last advisory. We think that 45 is closer now and that depends on if the cluster of storms to the southwest can hold on. There is nothing new to report with the forecast. It should recurve toward southern Baja in a few days as the upper trough comes in. If the shear totals strips the convection, it will continues more northwest. The convection has rebuilt over the center of Lowell. 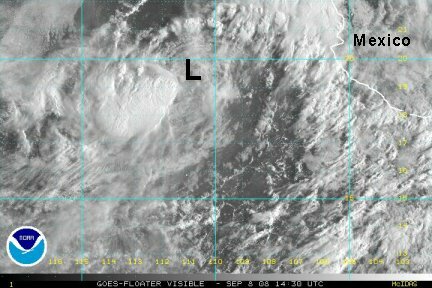 This process of the convection being pushed west then rebuilding east has occured several times during its lifetime. NHC has Lowell officially back up to 50 mph. This looks reasonable with the reorganization. Lowell is looking rather disorganized at this time. Officially its top sustained winds are 45 mph. That may be close in the convection to the west. 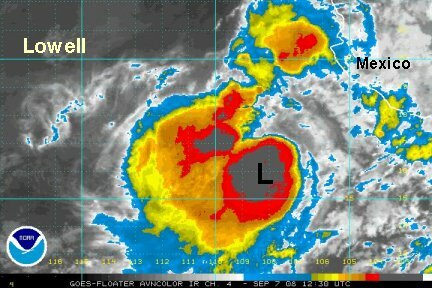 Lowell is moving northwest, but should start to recurve north, then northeast soon. This will bring rain to the Baja well north of Cabo by later tomorrow into Thursday. 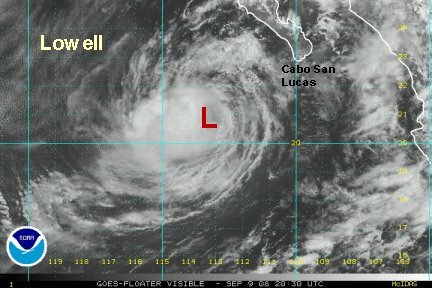 Lowell is disorganized and now is turing toward the Baja. The low center is still on the eastern edge of the showers. The low will move into Baja with its showers later tomorrow into Thursday. Officially Lowell is at 45 mph. Lowell is on track to bring showers to the southern Baja Wednesday through Thursday. It is becoming more disorganized with only a few heavier showers on the west side of the circuation. Officially Lowell is at 40 mph. It's probably weaker. It's interesting to note that NHC agreed with our earlier assessment in which we thought that Lowell was weaker. They downgraded Lowell to a tropical depression on the 2 am pdt advisory. 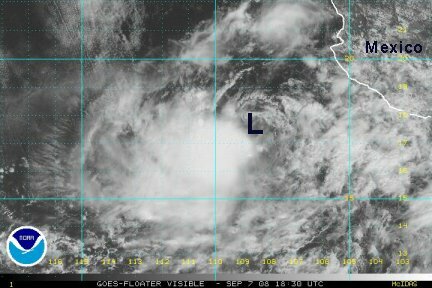 In the five hours since then, new convection has refired over the center of circuation. 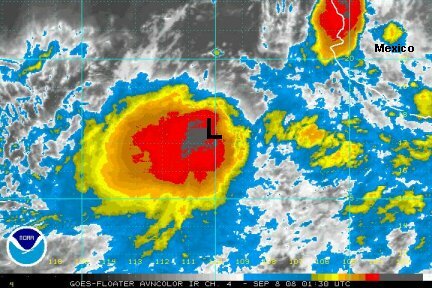 It is probably still a tropical depression at this time, but if the convection persists, it may briefly try to make t.s. status just before landfall. In either case, there is essentially almost no difference between a 35 mph tropical depression and a 40 mph tropical storm. Look for rain showers to continue to spread over the southern 1/3 of the Baja today into tomorrow. Locally heavy showers are possible with any storms that develop. The center is moving inland slowly and should make landfall by late this evening. Some of the moisture from Lowell may enhance rainfall in the southwestern U.S. This will be our last update on Lowell, unless it is upgraded to a tropical storm again.